Blood Ties by Alicia Lynn Wright is the second in a fiction fantasy epic series, Noble of Blood, that introduces us to Nikkola, Dartein's now grown up daughter. She leads a very sheltered life far from her grandfather's Palace of the Nobles, and is zealously protected by her father and his loyal guards. War, however, threatens to break out once again and Dartein needs a blacksmith so that he can protect his daughter and the Keep. He seeks a blacksmith in the human village and, as fate would have it, Dartein comes back with Friesa, a skilled blacksmith who happens to be a female human. Nikkola and Friesa soon become very good friends; this will lead them to the Palace of the Nobles, and Nikkola's life will never be the same again. Alicia Lynn Wright's Blood Ties: Nobles of Blood Book 2 is packed with a lot of imagination and peppered with action. Picking up from Book 1, author Alicia Lynn Wright once again brings us a story that is filled with twists and turns that will have us reeling at the end. Her characters are both likeable and relatable and this is in spite of the fact that they are mostly Nobles, not humans. This is especially true with Nikkola, the motherless young girl who, at the beginning, doesn't have a clue about the magic that she has within her royal fingers. 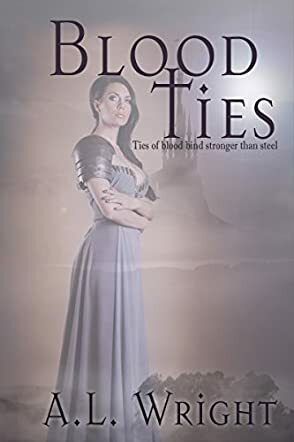 Blood Ties is a very engaging read and it makes the reader look forward to the next edition of this family saga of love, loyalty, sorrow, magic, power and a whole lot more! There is another war on the horizon. The goblins and their evil warlord, the Deep Dweller, are on the march and they’re causing all kinds of problems to the human communities protected by the Nobles. After his wife, died in childbirth, a heartbroken Dartein took refuge in the Keep where he brought up his daughter, Nikkola, and mourned his loss. He lived in the Keep for years, along with a few Nobles and his daughter. Times were changing and his daughter was now a young woman with magical power even stronger than his own or that of his father, the Patriarch. The frightening thing was that she didn’t know how to use it. And, when consumed by the blood that nurtures the Nobles’ powers, she is capable of unleashing more than anyone can imagine, bringing to light a concern that she might lose control of what she has. Alicia Lynn Wright’s fantasy novel, Blood Ties (Noble of Blood Book 2), is a fast-paced story full of action and romance. As this is the second book in a series, the reader might struggle to get a sense of the characters, the setting and the back story that led to the current events. The three main groups of characters appear to be the humans, the Nobles and the goblins; the humans and Nobles being the protagonists and the goblins and their leader, the Deep Dweller, the antagonist. In spite of some lack of comprehension on some key elements, the story reads very well: good descriptive narratives, good character development, and a steady rise of action in the plot. The resolution seemed to fall short as the story was cut off, presumably because there is another book in the series. Overall, a gripping story and one that will no doubt inspire readers to go back and grab the first book to catch up. A must for fans of romance and fantasy-based tales. Nikkola is a Noble Princess, but she understands little of that. She only knows what her father, Dartein, has told her of her heritage and the life she was born into, when her father fled the palace nineteen years earlier to escape the terrible grief of her mother’s death giving birth to her. Nikkola understands she is special and has magical powers but is loath to share this knowledge with her father or her protector, her father’s best friend, Victor. Blood Ties: Noble of Blood Book 2 by Alicia Lynn Wright presents us with a fantasy world where the immortal nobles are charged with protecting and saving the humans from the predation of marauding goblins. Thousands of years ago, three warlocks led by Nikkola’s grandfather, The Patriarch, believed they had destroyed the goblins and their evil leader for good, but it appears the goblins are now gathering to strike again. Dartein must reconcile with his father, and join forces with him and the other two warlocks to defeat the goblins again. Nikkola must learn and understand the powers she has been born with in order to fulfill the prophecy that she is the one who will save the world. I found Blood Ties: Noble of Blood Book 2 to be a thoroughly enjoyable read. As a fantasy, it is a little short and as part of a series does leave the reader hanging and thirsting for more knowledge and information, but nonetheless, the story holds together extremely well. Author Alicia Lynn Wright has created characters that are believable and easy to identify with. Even the immortal nobles are not immune to many of the flaws of humanity. The human girl, Friesa, who becomes best friends with Nikkola adds a normality to the magical, immortal story, which I found refreshing. What I did particularly like about this story were the use of common and easily readable names, rather than the difficult to pronounce and differentiate names so many fantasy authors seem wont to use these days. The writer’s style is simple, straightforward and easy to read, which makes it so much more enjoyable and easy to follow. As a second book in a series and despite my not having read the first book, I could quickly grasp and follow the story and its history with excellent references to the past scattered throughout the tale. I would happily read book three now to see where the battle against the evil Deep Dweller heads for these characters.